How Secure Is SSH – Really? Every day, millions of network administrators rely on the SSH (Secure Shell) protocol. SSH enables them to log in to servers remotely, tunnel into networking equipment and transfer files between different machines. 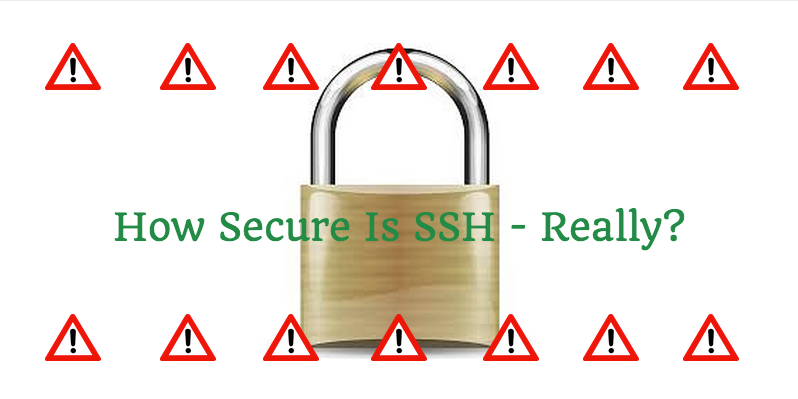 For most of its life, SSH has been regarded as “impenetrable” by many security experts. However, some questions have begun to arise in the last couple of years. Is SSH really as secure as we once believed? The truth is that a number of different flaws and vulnerabilities have been exposed within the popular security protocol. The infamous Systems Administrator, Edward Snowden, provides the perfect example. If you aren’t familiar with him, Snowden used SSH keys to authenticate and manage different systems every single day that he was on the job. Eventually, he learned the protocol so well that he was able to gain access to a wealth of Classified Government information – and this all began before he started working with the NSA (National Security Agency), an agency within the United States Federal Government. Snowden wasn’t the first or the last to expose the weaknesses within SSH. Here are some common issues that may be putting your own data at risk. Outdated SSH Versions: If you’re using an outdated version of SSH, you are setting yourself up for failure. Malicious users can easily access outdated shells and begin inserting arbitrary commands into new or existing sessions, gaining them remote root access to the SSH server. Always make sure you’re using the most up-to-date version of SSH. Buffer Overflows: For those who don’t know what a “buffer” is within this context, think of it as a temporary storage area. The buffer overflow vulnerability occurs when a program (or process used by a program) gets forced into storing more data than it was initially intended to hold. In effect, this causes software applications to either crash or to fail to block malicious users who might be trying to place and run their own harmful code within the system. Data Elements: Previous problems have also been discovered in SSH with how the transport layer protocol implementations would handle different data elements that contained things like incorrect length specifiers, lists of data which contained empty elements, and strings of characters that included “null” or empty characters. Such vulnerabilities could enable malicious users to crash the SSH client or server software. A denial of service attack could then be started, or the user could place and execute code on the machine that’s running the vulnerable software. The best way to stay updated with all the latest SSH vulnerabilities and updates would be to follow the CERT Coordination Center’s official website. This organization boasts different divisions dedicated to testing, hacking and solving virtually all issues relating to cybersecurity. And while SSH is one of the most secure protocols out there, it’s important to remember that nothing is impenetrable. There is always the possibility of some new vulnerability. However, there are steps you can take to protecting your own network. For more information, review this introduction to SSH we created just a few weeks ago. This entry was posted in All About VPS and tagged Data Security, Network Security, Server Features, Server Monitoring, SSH. Bookmark the permalink.